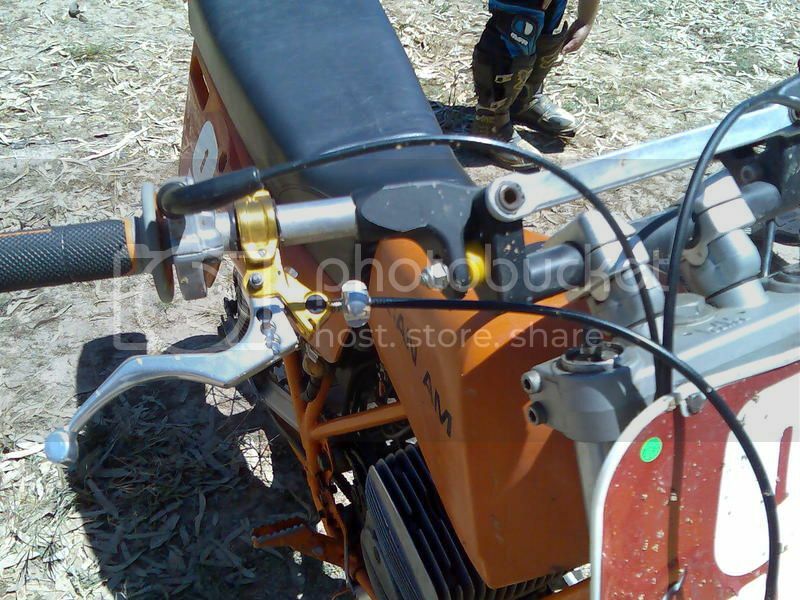 Yes there are few ideas for curing handlebar vibration (once engine mounts and swingarm are tight), lead bar-end weights work for sure but for off-road use l don't think it is acceptable. I'm thinking l should have filled a length of rubber tube (say 8mm) with silicon, then slide the tube through the bar, then fill the cavity between the rubber tube & outer steel tube. This will keep the silicon thinner, hence quicker to cure, though l don't know if cured silicon has better vibration absorbing qualities than uncured? Anyone had a good a good fix on the issue? Also, anyone know what silicon cures without contact to air? Maybe lead-shot pelletts in the end of the bars? Anyone know where l can buy lead-shot from? From the wacky inventions thread from years ago. Have you thought about having the balance factor of the crank looked at? But doesn't balancing a crank on a single cylinder only smooth it out at a particular rpm? So either side of that rpm it will vibrate? Surely the manufacturers know the weight of pistons/rods/used rpm to get it correct in production? Tungsten is far more dense than lead and should stop 80% of the vibes at the bars, the most effective is to rubber mount the front engine mount(s) and the head stay, so the engine can move slightly in the vertical plane. They are the damaging vibrations and the ones you feel the most. The vibrations sap energy and concentration from riding. Thanks Guy's :-) l started my CR500 today, filling the bars with silicon has cut the vibes by about 50%, l'll have a test ride and see how it feels. Jodie (my partner) works at a transfer-station, she brought some lead home today, l might ram the last couple of inches of handlebar with it for another test. I'll let you know how it goes. 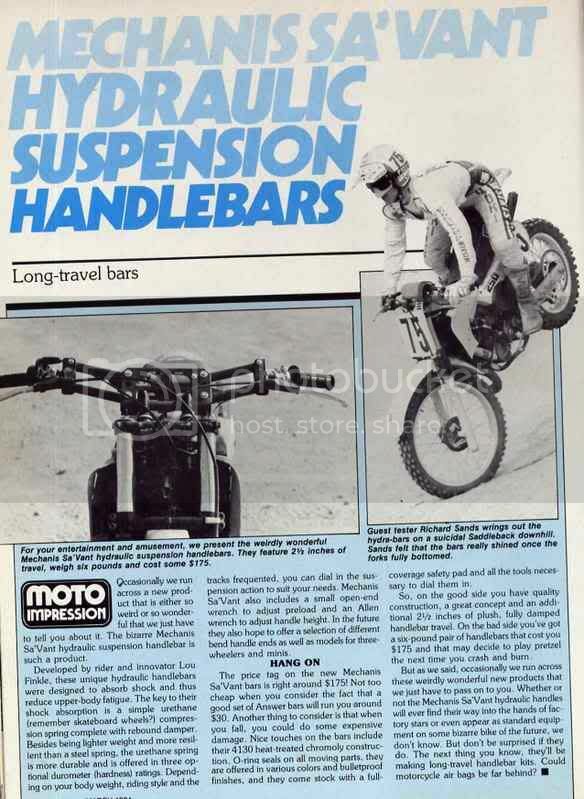 I had some solid aluminium bars that were brilliant at stopping vibration (but were flat bars so did stay long ). I've never seen another pair but I guess thick walled alloy bars will be similar? Most of the old RM's had engine bolts that were too small in diameter for the case holes. The fix was to re drill the case holes and match with correct diameter bolts. It works in reducing vibration. Maybe consider lead fishing sinkers as an easy buy . My CR500 runs its original 7/8 steel bars (l'm a stickler for period), firstly l completely filled them with silicon, l was very happy with the reduction in vibes, just for interest sake l thought l'd try gluing in 4" of lead in each end of the bars, maybe not quite as good as full silicon. Sure it will take years for the silicon to completely harden (needs exposure to air) but it seems that it doesn't need to cure to do the job? Maybe when it cures it may not dampen as well? When l was injecting the silicon l was going to do it in stages, to give it time to cure before injection more but the bars filled up quicker than l thought they would, they took nearly a full $10 (from Bunnings) squeeze gun of black silicon. I am so happy with how it worked, l am going to try filling a set of alloy bars l have on another bike.